Is the third season of NBC’s The Good Place TV show heaven-sent? As we all know, the Nielsen ratings typically play a big role in determining whether a TV show like The Good Place is cancelled or renewed for season four. Unfortunately, most of us do not live in Nielsen households. Because many viewers feel frustration, when their viewing habits and opinions aren’t considered, we’d like to offer you the chance to rate all of The Good Place season three episodes for us. **Status update below. 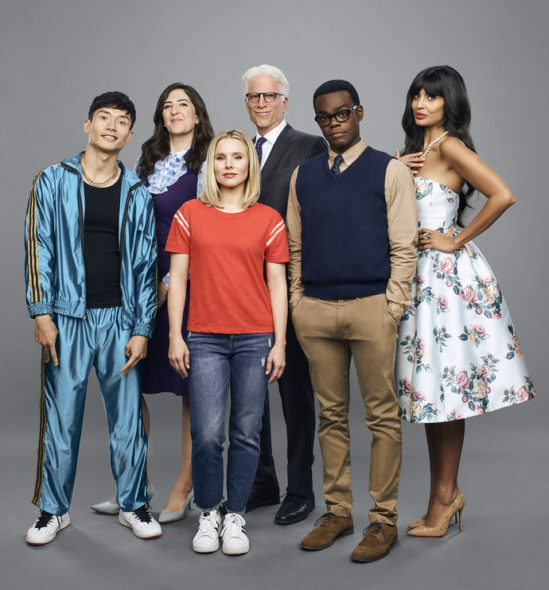 An NBC sitcom, The Good Place stars Kristen Bell, Ted Danson, William Jackson Harper, Jameela Jamil, Manny Jacinto, and D’Arcy Carden. Kirby Howell-Baptiste recurs in season three. The series centers on Eleanor Shellstrop (Bell) who, after dying, mistakenly ends up in The Good Place — instead of The Bad Place — where she truly belongs. Along with fellow lost souls, indecisive philosopher Chidi Anagonye (Harper), shallow socialite Tahani Al-Jamil (Jamil), and blundering Blake Bortles super-fan, Jason Mendoza (Jacinto), Eleanor tries to find the good person within. After pleading their case to the Judge (Maya Rudolph) in the season two finale, the gang is given a second shot a living a good life. Season three finds them back on Earth. Separated and retaining no memory of one another their task seems insurmountable until they get a little help from Good Place architect Michael (Danson) who, along with not-a-robot Janet (Carden), is watching over them from afar. What do you think? Which season three episodes of The Good Place TV series do you rate as heavenly, hellish, or somewhere between? Should NBC have cancelled or renewed The Good Place for a fourth season? Don’t forget to vote, and share your thoughts, below. **12/4/2018 Status Update: The Good Place is renewed for season four on NBC. Details here. More about: The Good Place, The Good Place: canceled or renewed? The Good Place: NBC Teases the Finale; Will There Be a Second Season? Love love love this show!! Love Kristen as Eleanor and the rest of the cast!!!! Please renew for the forth season!!!! !